SMS Auto-reply! SMS assistant for busy bees! 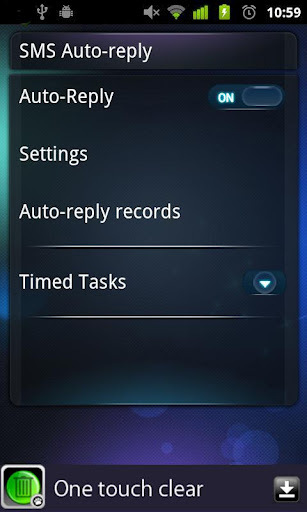 When you are busy or inconvenient to answer the phone, this app will automatically reply the incoming calls and received text messages by simply turn on the auto-reply feature. Reply every call, text message politely! (Custom settings available). * Auto-reply: this app will automatically send SMS according to the range and contents set by the user. Default reply range: only reply calls and SMS that is your contacts. You can customize the settings by modifying the reply range. * Special reply list: Users can customize the Special reply list by adding different contacts and replies. Make the auto-reply more flexible and user-friendly. Note: When default SMS reply feature is on, the same content will be replied to all calls and SMS; when default is off, this app will only reply to numbers that are in Special reply list. * Time tasks: Users can customize timed replies by simply entering the number, content and reply time. * Auto-reply record: this app will automatically record every auto-reply for users to check.